If you want a quick and dirty version of our recommendations check out our table, if not please continue reading. Capacity:It can easily fit two paddles of all sizes and few pickleballs. Capacity: You can carry mulitple paddles, all your pickleball equipment, apparel,water bottle, towels and here’s the kicker – your shoes! Capacity:It is able to fit few paddles and balls at the same time. Capacity: Carry paddles, balls, apparel, and water bottles Capacity:It is able to hold a single paddle at most. If you’re new to pickleball then you wont believe me when I say there were probably five good pickleball bags available in the market 2 years ago. Now the market is booming with all the new designs to best meet our pickleball bags/covers needs. But along with the good one’s there are also quite a few bad designs who think a colorful handbag will pass for a pickleball bag. Pickleball bags are just like any other racquet sport bags,they are designed to hold all your equipment conveniently at a single place. Ideally, a pickleball bag should be large enough to hold multiple paddles, pickleball balls and it should have compartments for other necessary items like a shoes,apparels,water bottles,cell phone, keys, and wallet etc. Apart from that pickleball bags must be lightweight with suitable dimensions for paddles and made from a material that are weather resistant. Shoulder strap design, net hook, zippered pockets, material strength, carrying capacity and side pockets are also important considerations before choosing your bag. The simplest of bags, paddle cover bags are ideal for players who need an affordable option to keep paddles safe. Typically used by gym goers who do not need to carry pickle balls with them. Usage: Works perfectly for those who only carry paddles to court. A damaged paddle or edge guard can impact your accuracy, shot power and spin. Cover bags can hold a maximum of two pickleball paddles at a time. Definitely, the most popular, sling bags are preferred for their light weight and single strap convenient design. A sling bag can easily hold more than two paddles and multiple pickle balls at a time. Front zippered pocket can be added to hold additional accessories. Usage: A sling bag is suitable to hold equipment for a casual pickleball player. Resembling a badminton bag, duffel bags are sought by players because of extra spacious design. More than four paddles, a dozen pickle balls, towels and a water bottle can be easily adjusted in a single compartment. With side pockets, you get even more options. Usage: Because of its size a single duffel bag can easily hold equipment for two player team. Less popular but more versatile backpacks allow for greatest space. You can easily carry your partner’s equipment as well. Multiple pockets on the inside and outside provide storage for pen holders, car keys and literally everything. Usage: Backpacks are suitable for professional tournament players. Bag must be made of highly durable material like neoprene or rip-resistant sail fabric. It should also be waterproof with an internal lining for additional protection. It should easily hold edgeless and edge protected paddles along with handle if possible. Large pickleball bags should have side compartments and zippered pockets that are easily accessible. A pouch for water bottle is also a must. Not to toot our own horn but we designed this pickleball bag with few things on mind. Combining convenience, durability, and water-resistance, V&A Pickleball bag is ideal for those who prefer to use dual paddles and are few balls. This cover bag’s biggest advantage is its ability to snugly fit two edgeless or edged paddles regardless of their size. Protective cushioned insulated inline ensures water-resistance. Sleek design with black color, single blue shoulder strap, and single zipper allows for easy carrying of paddles. The protective covering is also suitable for the rainy weather, ensuring that your expensive paddles remain protected at all time. Paddles Capacity: It can easily fit two paddles of all sizes. Spacious is the word of the day for pickleball players and this duffel bag delivers just that and much more. It is distinctive as it contains a huge inner compartment easily able to fit multiple paddles and a dozen balls. An outside slip pocket will help you carry a water bottle,towel,apparel wherever you go. It is suitable for all heights because of its adjustable shoulder strap. 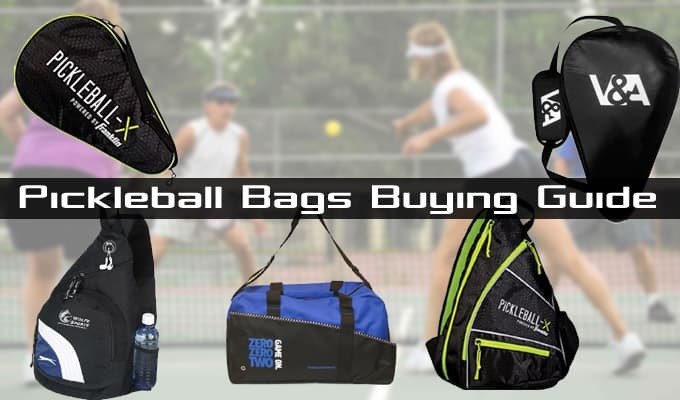 But there are two factors that puts it on top of all other pickleball duffel bags – shoe pocket and the price!! Paddles Capacity: This duffle bag is able to fit 2 to 4 paddles. This sling bag from Pickleball Central is a one-stop solution for your equipment. With a shoulder strap and a fence hook, moving the bag around is really easy. Felt lined mobile pocket and protective padding all around the bag ensures paddle and electronics safety. Paddles Capacity: multiple balls and paddles. Onix is leading sports equipment company and their pickleball bags live up to their name. With multiple internal pockets, cell phone pocket, and external side pouch, this bag can easily hold two paddles, pickle balls, towels,water bottles, snacks, and other equipment. Thick padding will protect internal contents from damage. From Franklin Sports, this pickleball bag can hold a single paddle. Lightweight casing, high-quality stitching, stylish black look and a net hook makes this cover bag truly stand out. Coming at an affordable price, the fabric is heavily padded to protect your paddle. Paddles Capacity: It is able to hold a single paddle at most.